Open Letter to: The Chair of the Racial Disparities in the Criminal and Juvenile Justice System Advisory Panel. This communication is to address the specific Act 54 Report content related concerns expressed by the Racial Disparities in the Criminal and Juvenile Justice System Advisory Panel. The report was submitted by the former Chair and Co-chair on March 2nd, 2018. Despite our numerous requests, the Panel has brought no concern surrounding content to our direct attention to date. Recently we discovered concerns in the Panel June Minutes. These concerns (requested five months ago) are seemingly being represented as the premise of the committee’s overwhelming rejection of ALL of the recommendations in the report. This being the case, it would have been appropriate and responsible for the Panel to enable the former Chair and Vice-chair to provide clarity surrounding any concerns expressed about recommendations in the report. The decision to abandon a year of work is one that should be made with due diligence and facts not “emotion” and politics. “The Racial Disparities in the Criminal and Juvenile Justice System Advisory Panel has held six meetings in as many months. Rules of engagement were disseminated in the Panel, which adopted generally agreed upon “Guiding Principles”. The Panel developed subcommittees on Public Complaint Process, Racial Profiling and Data Collection. The Committees each had a series of meetings and reported back to the Chair. The Panel then reviewed and discussed the draft report, prior to its final release. Upon completion of discussions and collection of data, the Chair and the Vice Chair, with concurrence of the Attorney General, created the report. This premise suggests that none of the panel members (particularly agency heads) have what could be personal or professional conflicting interests. Further, the Chair’s Reentry work at the CJC has no association with what would be a Racial Discrimination Reporting process. Finally, the Chair resigned from the CJC in February 2018 (prior to the time the report was released). The Panel had an open discussion about centralized data collection. There is currently no system in place that aggregates and correlates all collected race related data for high impact decisions across ALL agencies. The need to do so is supported by the fact that the race data currently collected by law enforcement fails to serve the essence of the legislative intent because it is largely invisible and unusable to the general public. Further, the implementation of such centralized race data collection; correlation and presentation platform would provide economies of scale, ultimately providing savings to agencies across the state. The Subcommittee on Racial Profiling agreed by vast majority that Racial Profiling should be illegal but could not agree upon language. Our research and discussion with attorneys including the Assistant Attorney General, the Executive Director of the Human Rights Commission and former Director of the Human Rights Commission and Defender General indicated that the assertion that “racial profiling is already illegal” is somewhat of a misnomer. The Human Rights Commission’s jurisdiction over public accommodations in conjunction with the inclusion of race as one of their protected categories by default encompasses what would be considered “racial profiling” (civil). Unfortunately, the precedent for public roadways is vulnerable in that it is only a Superior Court Decision. The ACLU Policy Attorney indicated that racial profiling is currently illegal in 30 states, but expressed concern about making racial profiling Illegal. 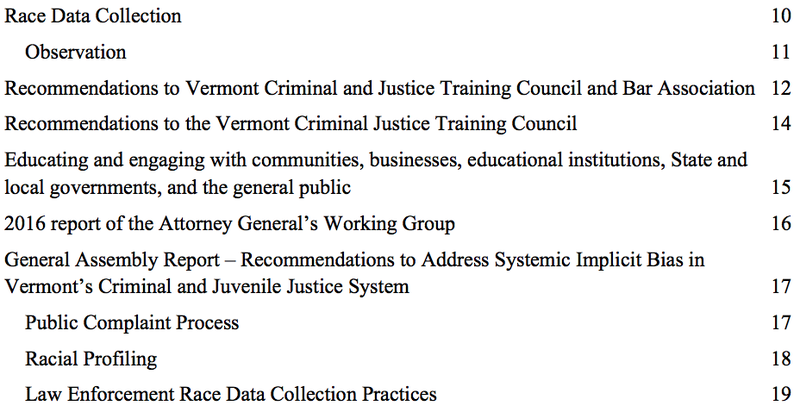 A screenshot of the table content of the, report below maps to the legislative reporting as well as all other elements of the Racial Disparities in the Criminal and Juvenile Advisory Panel charge. It should seriously concern the community that after five months the Panel has delivered us NO content concerns; from Minute reports, only three of the 17 recommendations are being challenged; ONLY newly Attorney General appointed community Panel members have raised questions on recommendations (none of agency representatives) and the entire process is being reinitiated (throwing out all recommendations). This is the real injustice that is occurring. We posit that agency members of this panel are reluctant to give an up-down vote on any given recommendation for fear of political repercussion or organizational change. They have instead chosen to respond to our requests with personal attacks and outcries that our process was inconsistent with Act 54. We never denied that. In November of 2017, the Criminal Justice Training Council’s process of changing the Fair and Impartial Policing Policy (unilateral) was inconsistent with Act 54. Assistant Attorney General Scherr and the Panel were made aware (Act 54 Update agenda item at a Panel Meeting). Major Jonas (Public Safety) immediately dismissed the update as a “mischaracterization”. 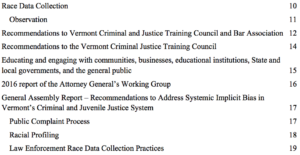 All legislative leadership (oversight) are aware of the Vermont Criminal Justice Council’s blatant disregard for the process of changing the FIP. The Council’s decision to disregard the letter of the law was to ensure that the state police received five hundred thousand dollars (and additional money for local departments) from the Department of Justice (Community Oriented Policing Grant). We acknowledged the letter of the law by consulting the Attorney General before acting to ensure that recommendations to mitigate systemic racism were given a real chance to be considered, enabling hope for our children. Mr. Chair, you stated that the Panel would start the process from the beginning because of your concerns that there was “too much emotion” behind the existing report. This decision is clearly at the expense of the countless hours of deliberations and committee work documented in Minutes, personal notes and on the ORCA Media web site. This will enable agency heads to be able to bury the recommendations and produce something more to their liking without ever having to go on record on any given recommendation. Lastly, a simple “thank you” and a humble apology is the least the Attorney General and the Panel can offer the former Chair and Vice-Chair. We deserve nothing less. ← Systemic Racism Mitigation Bill Signed Into Law!